US Embassy London Hosts Reception Showcasing "Carbon Nation"
Written by Chrisna on 10 January 2012 . On December 1, the U.S. Embassy's Deputy Chief of Mission, Minister Barbara Stephenson, hosted an evening reception at her residence to showcase the entertaining and insightful documentary "Carbon Nation." (www.carbonnationmovie.com) Director and Producer Peter Byck narrated a selection of clips from the film, and engaged in a lively Q&A session with an enthusiastic audience. One of Peter's central themes – which he stressed in his remarks and is evident throughout "Carbon Nation" — is that the United States is not nearly as divided on climate/clean energy issues as many media accounts would have us believe. This is particularly true when the focus of discussion is on finding innovative solutions to the growing energy demands of the country and the world. The film highlights a range of clean energy technologies that are taking root in the U.S., including wind, geothermal, bioenergy, solar, combined heat and power, new generation electric vehicles, as well as a range of cost-effective energy efficiency measures. While there is no doubt that there have been difficulties enacting comprehensive climate/energy legislation at the federal level, Peter's film makes clear that there is a tremendous amount of activity taking place across the United States — at the State and Local levels of government and among many very creative and forward thinking U.S. companies. 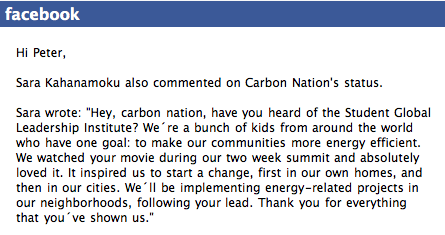 For those who have not had a chance to see "Carbon Nation" yet, we wholeheartedly encourage you to do so. After having seen it, you will have a much richer and more comprehensive picture of the many exciting clean energy developments underway in the U.S. For those interested, the film will be shown in its entirety on December 6 at 6:00 PM at The Tabernacle, off Portobello Road in Notting Hill, followed by a Q&A with Peter Byck. For more information on tickets and directions, please see the attached flier: Carbon Nation Showing on Dec 6. Written by Chrisna on 16 August 2011 . Written by Peter Byck on 28 June 2011 . Written by Peter Byck on 31 May 2011 . IN THE 1970s everyone thought environmentalism meant granola, which meant health food stores, which meant carob, a horrible substance the health-foodies told us we should eat instead of chocolate. In the same decade, US president Jimmy Carter reduced the speed limit on interstates from 70 miles per hour to 55 mph to save energy. Carter got kicked out and carob made it feel like "doing the right thing" was akin to taking medicine: the environmental movement was saddled with pseudo-chocolate and painfully slow driving. Now motoring is going electric, not because of its moral compass - it's just that the engines perform much better. I took a ride with Elon Musk behind the wheel of his company's new Tesla Roadster electric sports car. He floored it, and the g-force made my headphones rotate swiftly around my head. Goodbye carob, hello delicious chocolate! I'm a whiny liberal film-maker who has spent the past four years making Carbon Nation, a documentary about climate change solutions that doesn't even care if you believe in climate change. I know climate change is real and happening, but you don't have to agree with me to see the benefits of clean energy. A low-carbon economy is also a national security issue, a great business opportunity, even just a way to keep families together. As The New York Times writer Thomas Freedman says in the movie: "It's the most patriotic thing you can be, do, think or feel today. Green is the new red, white and blue." This is exactly where I have found great areas of common ground with knuckle-dragging conservatives. Finding common ground isn't supposed to be possible in the US - our lost, polarised land. But I'm here to tell you we're not polarised, and we're far from lost. We're being told we're polarised to keep political pundits in business. Problem is, that story is being bought by most in Congress, so our march to a clean energy economy has been stymied, to say the least.